Photo courtesy of Pro-Tec Athletics. Variables related to iliotibial band strain appear to be important risk factors for development of iliotibial band syndrome (ITBS) in runners, a finding that is beginning to change the way researchers assess the effectiveness of gait retraining interventions to treat or prevent ITBS. We all know that we should exercise for optimal health and wellness. Unfortunately, lack of access to fitness facilities and other resources are barriers for many. Running, which requires little in terms of resources, is seemingly an ideal solution. In fact, 62% of persons who meet or exceed established exercise guidelines choose running as a form of fitness.1 However, despite its benefits, running for fitness and wellness is associated with a relatively high risk of injury. In recent years, significant research efforts have advanced the knowledge of running biomechanics associated with injury. Unfortunately, despite a greater understanding of forces and motions associated with injury and attempts to mediate potentially detrimental loads, injuries persist. The specific mechanisms of running injuries are as yet unknown, but they are typically associated with excessive or repetitive loading of the affected tissues.2 In attempts to better understand running injury, a variety of surrogate measures of tissue loading have been examined. These include, but are not limited to, lower limb kin­etics and kinematics. These measures provide insight regarding the forces applied to the runner and the motions runners undergo, but they do not provide information about what is happening at the tissue level within the body. Knowledge of the stress applied to tissue or the strain tissue undergoes in response to applied loads has the potential to enhance understanding of injury mechanisms and help guide effective interventions. ITBS is the second most common injury sustained by runners, accounting for more than 8% of lower extremity injuries.4 A recent anatomical study by Fairclough et al5 suggests that ITBS may be due to compression of adipose tissue between the lateral epicondyle of the femur and the iliotibial band. Fibrous bands running from the distal ITB to the femur were observed in 15 cadavers; the bands appeared to restrain the ITB from rolling over the femoral epicondyle. In the same study, highly innervated adipose tissue with a large amount of vascularization was found between the distal ITB and the lateral femur. Magnetic resonance imaging also revealed that the ITB is compressed against the lateral femur when the knee is flexed to 30º. Compression may be due to external rotation of the femur relative to the tibia in loaded positions, resulting in relative internal rotation of the tibia.6 Thus, it is probable that loads increasing compression of tissue between the ITB and the lateral epicondyle are related to the development of ITBS. Due to the origin of the ITB at the outer lip of the iliac crest and the insertion at the lateral retinaculum, anterolateral proximal tibia, and tibial tuberosity, greater ITB strains and adipose tissue compression are likely to occur with coordination patterns resulting in greater hip adduction and knee internal rotation. 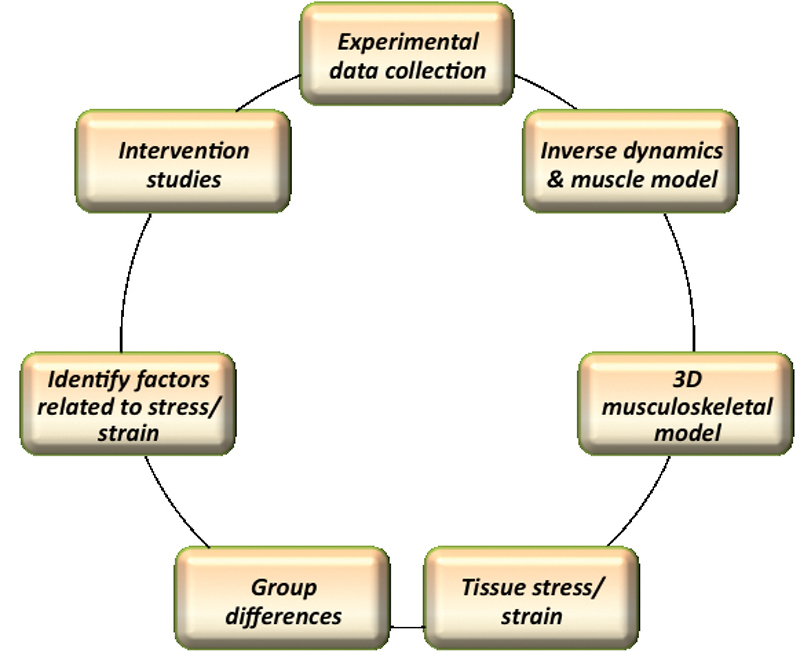 Direct measurement of tissue strain poses significant challenges and ethical considerations. Traditionally, ground reaction forces and kinematics have been used to estimate musculoskeletal load during running. However, these measures capture only a portion of the loading environment since contribution from the musculature is not considered. Computer simulations of human movement can model the musculoskeletal system using subject-specific anthropometrics and 3D motion data (Figure 1). These models can be used to provide estimates of muscle force and length, as well as insights into the changes tissues undergo during human movement. 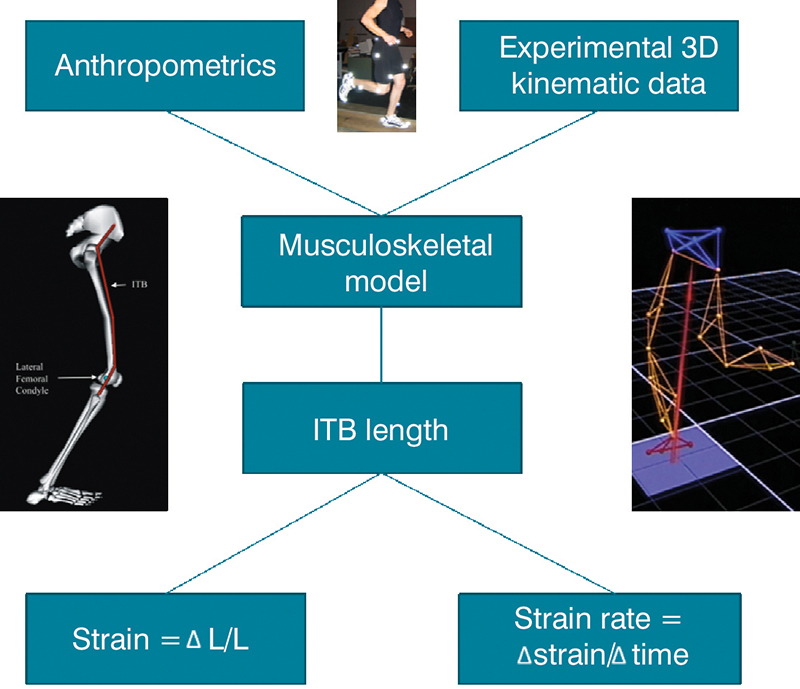 In an example of a model-based approach to running injury research, Miller et al7 evaluated ITB strain in runners with a history of ITBS using a musculoskeletal model of the human lower limb (Figure 1). The model calculated the ITB length at each point in time across the stance phase of running. ITB strain was calculated by dividing the change in length of the ITB by the length of the ITB in the anatomical position. Eight runners, previously diagnosed with ITBS by a physician or physical therapist, had elevated ITB strain across the stance phase of running when compared with eight matched controls at both the beginning and the end of an exhaustive run (effect size d = 1.05 and .86, respectively). Unfortunately, due to the retrospective nature of this study, causation could not be clearly established. To address the retrospective limitation, Hamill and colleagues used a similar model to evaluate ITB strains in female runners who participated in a large prospective investigation of lower extremity injuries.8 Using motion data collected prior to injury, 17 runners who went on to develop ITBS during a two-year follow-up period demonstrated moderately greater ITB strains (d = 0.45) at the point of stance phase corresponding to maximal knee flexion and markedly greater strain rate (d = 1.91) from touch-down to midsupport when compared to matched controls. Because of the prospective nature of this study, a clear correlation between relatively high ITB strain parameters at baseline and future injury was established. In the same study, to better understand contributors to elevated ITB strains, researchers examined how peak strain and strain rate were related to hip adduction and knee internal rotation—variables identified in an earlier analysis as biomechanical factors related to ITBS.9 In this previous work, researchers considered the development of iliotibial band syndrome to be strongly related to increased peak hip adduction and knee internal rotation. Not surprisingly, Hamill and colleagues found that, as peak hip adduction and knee internal rotation increased during the stance phase of running, ITB strain increased (correlation coefficients r = .34 and r = .24, respectively).8 Moreover, as peak hip adduction and knee internal rotation increased, rate of loading on the ITB increased (r = .42 and r = .30) respectively). This suggests that a reduction in peak hip adduction and knee internal rotation during running may reduce ITB strains and strain rates. Interestingly, the gait mechanics linked to ITBS by Noehren et al8 and Hamill et al7 are likely to occur with a crossover or narrow step width running style. Widening a step width that is narrow has the potential to reduce loading of the ITB. Although no studies have affirmatively linked narrow step width during running to ITBS, narrow step width has been raised as a point of concern among runners anecdotally.10 Placement of the front foot medial to the line of progression (i.e., a crossover pattern) has been reported to increase pronation, pronation velocity, and tibial excursion.11,12 However, until recently, no reports on the influence of step width on the hip and knee were available. In 2012, we published a study on the effect of step width manipulation on ITB strain, strain rate, and known kinematic predictors of ITBS.13 Fifteen healthy runners were examined and step width was defined as distance between the right and left central heel markers when each heel was at its minimal height. Runners were asked to run in three step width conditions (preferred, narrow, and wide). In the narrow and wide conditions, participants were asked to respectively narrow or widen their step width. 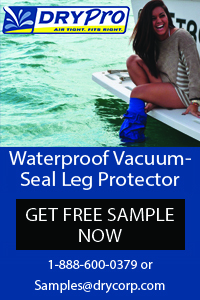 Only trials that were at least +/- 5% of leg length were accepted. Runners received feedback after each trial. After a several practice trials in each condition, participants were able to successfully manipulate their step width. Figure 2. 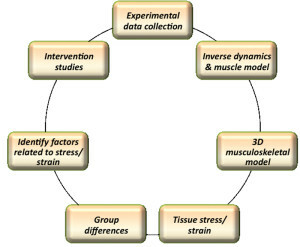 The progression of ITBS study design: Musculoskeletal modeling helps to understand the strain that tissue undergoes; once this is known, researchers can identify factors related to elevated strains associated with injury, which in turn will drive intervention. The advantage of addressing running mechanics and movement coordination in ITBS is that the underlying movement patterns contributing to elevated loads can be altered. Recent gait retraining studies suggest that modification of running style can reduce loads.9,14,15 Thus, training individuals to run with a slightly wider step width may reduce tissue loads in runners who are experiencing elevated ITB strain and strain rates. Gait retaining in combination with strengthening may further benefit runners with ITBS, since altering strength has the ability to change the constraints within which runners operate, facilitating a new or evolving coordination pattern. After six weeks of rehabilitation focusing on gluteus medius strengthening, runners with ITBS demonstrated increased hip abductor strength and reduced pain, and were able to return to running.16 Further work specific to the retraining of step width and integration of strength training is needed. Caution should be exercised, however, when prescribing or subscribing to gait-related modifications. Running with a wider step width can be metabolically costly17 and may influence underlying postural control.18 Additionally, altering movement patterns has the potential to reduce loads on certain tissues but may inadvertently shift loads to other injury-prone tissues. A temporary reduction in overall training volume may be needed to avoid injury while tissues adapt to new loading environments. In general, recommendations should be made based on the clinical presentation of the patient. Runners with ITBS who do not run with a narrow step width likely will not benefit from running with a wider step width. However, the threshold width for making this distinction is unknown and is likely runner-specific. Other factors linked to the development of ITBS, such as rearfoot eversion and weak hip abductors,16,19,20 need to be examined. Interventions should be based on the presence or absence of these factors as well as observation of the patient’s preferred running style. Reflection on the biomechanical studies that have advanced our understanding of key contributors to ITBS reveals an interesting and potentially promising progression of study design, centered on musculoskeletal modeling and gait adjustment and retraining. To understand running injury, we need to understand the strain that tissue undergoes. Once this is known, we can identify factors related to elevated strains associated with injury, which in turn will drive intervention. Studying injury from this perspective may help researchers and clinicians better understand causal and preventive factors in overuse injury (Figure 2). It is clear from the line of research described above that elevated ITB strain rate and, to some extent, strain magnitude, are risk factors for development of ITBS. Hip adduction and knee internal rotation during running have been identified as key factors related to ITB strain and strain rate, though the relationships between other biomechanical factors and ITB strain and strain rate have yet to be examined. The next step is to systematically assess the efficacy of interventions in reducing strains acutely and over time, as has been done in the step width manipulation study. We believe that in this manner, technology will drive our understanding of movement and overuse injury and will also drive future interventions. 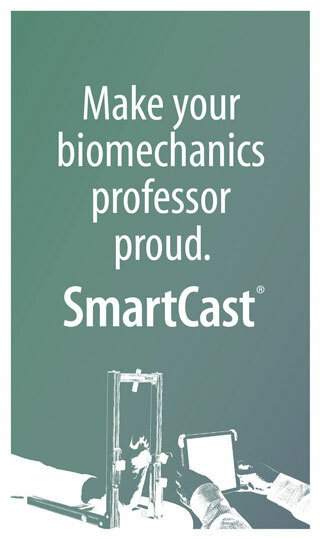 Stacey Meardon, PT, PhD, ATC, CSCS, is an assistant professor in the Department of Health Professions at the University of Wisconsin–La Crosse. Ross H. Miller, PhD, is an assistant professor in the Department of Kinesiology at the University of Maryland in College Park. Disclosure: The authors do not have any financial relationships to products, devices or companies mentioned in the article. 1. Hootman JM, Macera CA, Ainsworth BE, et al. Epidemiology of musculoskeletal injuries among sedentary and physically active adults. Med Sci Sports Exerc 2002;34(5):838-844. 2. Hreljac A. Etiology, prevention, and early intervention of overuse injuries in runners: a biomechanical perspective. Phys Med Rehabil Clin N Am 2005;16(3):651-667. 3. Lindenberg G, Pinshaw R, Noakes TD. Iliotibial band friction syndrome in runners. Phys Sportsmed 1984;12(5):118-130. 4. Taunton JE, Ryan MB, Clement DB, et al. A retrospective case-control analysis of 2002 running injuries. Br J Sports Med 2002;36(2):95-101. 5. Fairclough J, Hayashi K, Toumi H, et al. The functional anatomy of the iliotibial band during flexion and extension of the knee: implications for understanding iliotibial band syndrome. J Anat 2006;208(3):309-316. 6. Hill PF, Vedi V, Williams A, et al. Tibiofemoral movement 2: the loaded and unloaded living knee studied by MRI. J Bone Joint Surg Br 2000;82(8):1196-1198. 7. Miller RH, Lowry JL, Meardon SA, Gillette JC. Lower extremity mechanics of iliotibial band syndrome during an exhaustive run. Gait Posture 2007;26(3):407-413. 8. Hamill J, Miller R, Noehren B, Davis I. A prospective study of iliotibial band strain in runners. Clin Biomech 2008;23(8):1018-1025. 9. Noehren B, Davis I, Hamill J. Prospective study of the biomechanical factors associated with iliotibial band syndrome. Clin Biomech 2007;22(9):951-956. 10. Uhan J. Going Wide: The Role of Stride Width in Running Injury and Economy. irunfar.com. www.irunfar.com/2013/03/going-wide-the-role-of-stride-width-in-running-injury-and-economy.html. Published March 12, 2013. Accessed June 28, 2013. 11. Pohl MB, Messenger N, Buckley JG. Changes in foot and lower limb coupling due to systematic variations in step width. Clin Biomech 2006;21(2):175-183. 12. Williams KR, Ziff JL. Changes in distance running mechanics due to systematic variations in running style. Int J Sports Biomech 1991;7(1):76-90. 13. Meardon SA, Campbell S, Derrick TR. Step width alters iliotibial band strain during running. Sports Biomech 2012;11(4):464-472. 14. Crowell HP, Davis IS. 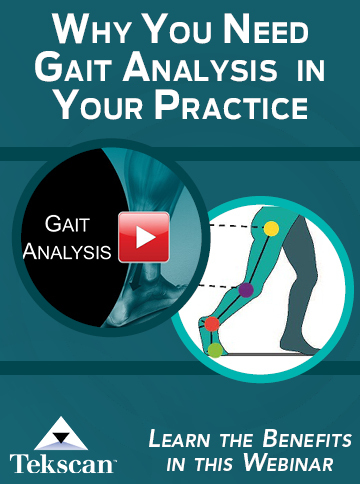 Gait retraining to reduce lower extremity loading in runners. Clin Biomech 2011;26(1):78-83. 15. Willy RW, Scholz JP, Davis IS. Mirror gait retraining for the treatment of patellofemoral pain in female runners. Clin Biomech 2012;27(10):1045-1051. 16. Fredericson M, Cookingham CL, Chaudhari AM, et al. Hip abductor weakness in distance runners with iliotibial band syndrome. Clin J Sport Med 2000;10(3):169-175. 17. Arellano CJ, Kram R. The effects of step width and arm swing on energetic cost and lateral balance during running. J Biomech 2011;44(7):1291-1295. 18. Brach JS, Berlin JE, VanSwearingen JM, et al. Too much or too little step width variability is associated with a fall history in older persons who walk at or near normal gait speed. J Neuroeng Rehabil 2005;2(1):21-29. 19. Messier SP, Pittala KA. Etiologic factors associated with selected running injuries. Med Sci Sports Exerc 1988;20(5):501-505. 20. Orchard JW, Fricker PA, Abud AT, Mason BR. Biomechanics of iliotibial band friction syndrome in runners. Am J Sports Med 1996;24(3):375-379.